I am in receipt of an email from Steve Skojec, publisher of the website OnePeterFive in which he defends his posts in which he argues for the validity of the election of Francis the Merciful on the basis of the “universal acceptance” of Francis’ election by the world’s Catholic population. The idea of “universal acceptance” of the election of popes of the past may have had it’s origin in the first centuries of the Church when popes were chosen by acclamation of the assembled citizens of Rome, and perhaps later when the princes and kings of Europe decided on the legitimacy of papal contestants in the time of the Avignon captivity of the papacy. But the idea of “universal acceptance” as the principle determining the validity of Francis’ claim to the Chair of Peter is absurd in this day of instant electronic communication. There is not a world-wide Pew or Gallup poll that can determine the degree of “acceptance” of the Bergolian regime as valid by the world’s Catholic population. From the moment that Francis appeared on the balcony of St. Peter’s Basilica improperly dressed and accompanied by men of known or suspected homosexual orientation many Catholics besides myself were shocked and dismayed. Almost immediately almost every word publicly uttered by Francis shocked Catholic sensibilities, such as telling the woman with several children to “stop breeding like rabbits.” Many Catholics withheld their “acceptance” and adopted a wait-and-see attitude. One thing is certain, the popes of the Twentieth Century were aware that the election of future popes was now no longer subject to the interference of kings and princes as in the past, now the corruption of the democratic processes for choosing the heads of nations was threatening the papal conclaves of the Church. Pope Paul VI, perhaps alarmed by the forces for radical reform of the Church follow the lead of his recent predecessor and published a revision of the Apostolic Constitution which governs papal conclaves. It is unthinkable that Pope Saint John Paul II was unaware of the plotting that began with the St. Gallen Mafia in the early 1990s. His magnificent Apostolic Constituion, Universi Dominci Gregis, was his prescient action to head off the corruption of the conclaves of the future. Yet, the rot at the center of the hierarchy had progress to such point that Jorge Bergoglio was almost elected instead of Joseph Ratzinger, but the St. Gallen conspirators succeed in 2013 with the election of Francis the Merciful. 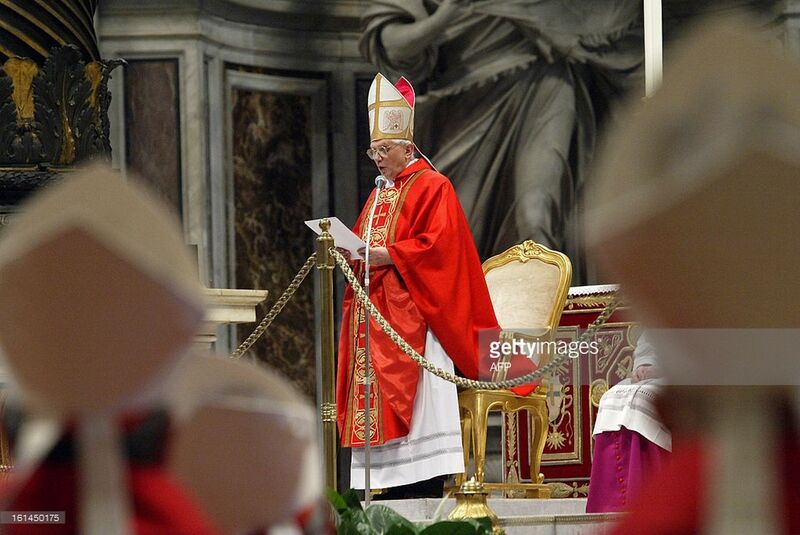 What is the sure test of the validity of the election of a cardinal to the papacy? It is not the medieval concept of ‘universal acceptance.’ It is compliance with the law of the Church. The Apostolic Constitution Universi Dominici Gregis is the only law in effect since it was published by Pope Saint John Paul II in 1992. If there is one characteristic that is common to the leadership of the Church since the Second Vatican Council is disregard for law, all law, divine law and canon law. Men who would be architects of the Church of the Future ignore the law of God and the law of His Church. That is why some cling to the outmoded concept of ‘universal acceptance’ of a man who obtained the Chair of Peter through the manipulations of many who by their immoral lives reveal their contempt for law, all law, including Divine Law. Apostolic Constitution, Universi Dominici Gregis applied. or any other principle extrinsic to Universi Dominici Gregis to discern the outcome of papal election. or any other principle extrinsic to Universi Dominici Gregis to discern the outcome. in discerning a Conclave called subject to Universi Dominici Gregis. or any other principle extrinsic to Universi Dominici Gregis in order to discern the outcome. Universal acceptance under the presumption that the election was valid, as in the matrimony. But if there was an impostor, the universal acceptance doesn’t validate the lie converting it in truth (it validates the acts done in good faith by others). Even if there are no prelates who dare to solve the conundrum, the imposture still is a lie and the election null. We are in new territory, because there are no precedents of the end of times, but it doesn’t make a lie being truth either. (1) The Gates of hell will never prevail, also God leaves signs for us. By their fruits thy shall know them. (3) There is the confusion of this current “Pontificate”. Catholics know what the truth is. Legitimate Popes make mistakes, but this one goes beyond it. I have just refuted Skojec and Siscoe. Recall that I have also refuted Sedevacantists too . Ratiocinations, rather than focusing on the juridical validity of the conclave and the election, might the resolution be even simpler in regards to fulfilling “all the juridical stipulations”. I mean if we go to the starting point and examine those stipulations for a valid resignation according to Canon Law 332.2, 18, 17, and in some respects even 188? For example according to his own words in the Feb 11, 2013 Declaratio, that which Pope Benedict resigned was the ministerium not the munus. As can be seen in 332.2 a valid resignation of the Papal Office requires three things, the first of which is resignation from the munus (muneri singular dative). That the Petrine Ministry is what Pope Benedict resigned is clearly evident in his black-and-white words. This is where the examination of the juridical validity needs to be focused. Since the Papal Office was never validly vacated, there was no need to call a conclave where all kinds of shenanigans took place in opposition to UDG. I feel as if I’ve been living in a Salvador Dali painting, a house of mirrors, an Escher sketch. Almost everyone, save a blessed few, seem to have lost their collective Catholic minds. So obviously true. It will prevail in time. God reigns. What is stated here should be required reading for every truly orthodox Catholic prelate. If there was a way to first discern and then contact truly faithful Cardinals, Archbishops and Bishops (without bringing it too much to the attention of the heresiarch prelates) there might be a chance for Pope John Paul II’s truly prophetic encyclical “Universi Dominci Gregis” to be effectively used to begin to undo the errors that have found tbeir fullest expression through the “Bergoglioian” Papacy(?). God only knows if there will be enough time granted to mankind to even begin to return to His Truth as it has been known for two Millennia. But Bishop Gracida, in pointing to JPII’s “Universi Dominci Gregis” has offered a pretty clear road map to his fellow Shepherds and they need to take a good look at it. And they need to understand what JPII was trying to accomplish when he wrote this IMHO divinely inspired encyclical. .
God knows the enemies of His Church don’t take their eyes off their own directives. “….because you are lukewarm, and neither cold nor hot, I will begin to vomit thee out of my mouth.” ??? This following is not intended as criticism of any kind towards Bishop Gracida and/or his thoughts and beliefs in this matter (and it obviously need not appear in my comment). I don’t know if it’s formatting, the WordPress software or something else. But there appears to be some excessive redundancy in this otherwise excellent post by Bishop Gracida. I don’t feel comfortable printing it and giving it to my own Bishop to read in it’s present form. But neither do I feel comfortable editing something on Bishop Gracida’s behalf, especially without him reviewing, approving and perhaps posting the edited version. I understand Biship Gracida’s sight is failing. Due to this, editing might be very difficult. If someone close to him could help edit this post on his behalf and get his approval for publication, I believe it would be a valuable service. Completely agreed. Bp. Gracida’s site should be bookmarked by everyone. If someone can show me a false premise in one of the bishop’s arguments, or an error in his reasoning, then I’m happy to give my ear. But I can find neither myself. Seems everybody misses the obvious. The problem with deposing an heretical pope is that the only ones that can depose him are the ones that voted him in. In this case there is no way that rogues gallery is going to do a thing but try their best to give us Francis II. This is likely the same reason no pope who uttered questionable statements in the past was deposed by an act of the Church. it took a subsequent pope to condemn Honorius and had John XXII not recanted on his own, he would have died pope. Dominici Gregis has covered everything … Uneducated me has read the whole thing … I got the impression that JP knew of the wickedness around him, and, expected that the conclave would be infiltrated. I don’t know all the ins and outs. Neither did I pull out Dominici until Bishop Gracida mentioned it the first time. I had copied the whole thing once … then put it away. wow ! God has given us all the answers in Dominici. I don’t know if that’s infallible but JPIII was the Pope when he wrote it. It stands with the encyclicals of the past as far as I know as far as the obligation to believe it. The present situation could not be stated more clearly than in the above and in other posts. Why seeming clever or intelligent men refuse to consider what should be examined in order to assure they possess the truth, ultimately, is rooted in their own improper dispositions of will and passions. It is often very unpleasant to face the full requirements of what must be scrutinized in order to assure that one has the truth of what is or is not the case. Some, it seems, prefer to not face the implications of such, but rather wish to presume that they are superior to others who humbly insist that truth always lies in the specifics …in this case, fulfillment of all juridical stipulations for a proper papal election. Nonetheless, the Father of Lies always espouses adulterating the truth, both contemplative/speculative or practical/operative to vague generalities and hasty conclusions by offering ambivalent ‘signs’ of what seems to be true, instead of the substance of what is or ought to be signified.